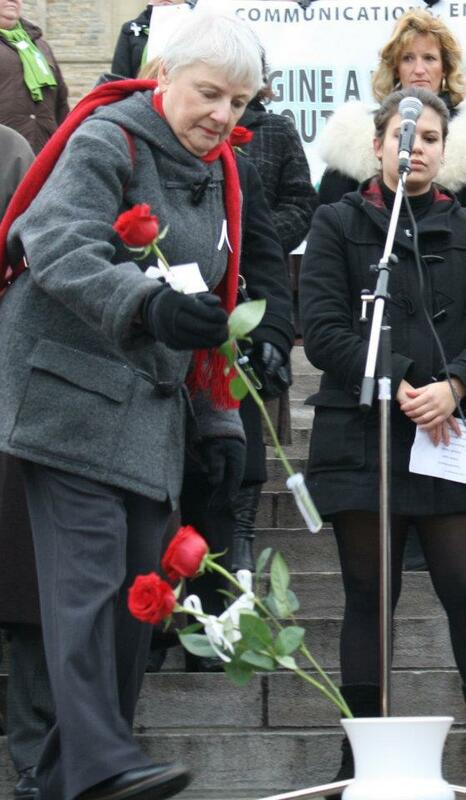 CFUW board member, Susan Russell laying a rose on the steps of Parliament Hill at the December 6th Rally on Parliament Hill for National Day of Remembrance and Action on Violence Against Women. Fourteen Roses in total were laid in commermoration of the women were killed in the 1989 Montreal Massarce. We also took this opportunity to protest the Government of Canada’s continued efforts to abolish the long gun resgitry. CFUW, as a member of the Coalition for Gun Control stands firmly against Bill-19 Ending the Long Gun Registry. Watch the video of the protest here. This entry was posted in Uncategorized on December 9, 2011 by cfuwadvocacy. OTTAWA (December 6) – Today, the Canadian Federation of University Women (CFUW) remembers Geneviève Bergeron, Hélène Colgan, Nathalie Croteau, Barbara Daigneault, Anne-Marie Edward, Maud Haviernick, Maryse Laganière, Maryse Leclair, Anne-Marie Lemay, Sonia Pelletier, Michèle Richard, Annie St-Arneault, Annie Turcotte and Barbara Klucznick Widajewicz. As we reflect on the lives of these 14 women who were tragically killed in the École Polytechnique massacre 22 years ago, we are reminded that gender based violence is an ongoing reality in Canadian society. We are also called to action – to do all that we can to bring an end to violence against women and girls. While some important steps have been taken to address gender based violence in Canada, we continue to live in a society where many women experience domestic abuse and sexual assault every day. Some women are more vulnerable to violence, as evidenced by the currently unsolved murders and disappearances of more than 600 Aboriginal women. This year’s day of remembrance and action is particularly important, as the federal government is now poised to dismantle the long gun registry. The registry, which was part of a response to the École Polytechnique massacre, is an important public safety tool that has contributed to the prevention of gun violence, particularly against women and children. “CFUW is very disappointed that the Government of Canada has refused to listen to public safety experts and women’s organizations, who have all insisted on keeping the long gun registry”, said Brenda Wallace, CFUW National President. “The government has even refused to allow reasonable amendments, such as restricting certain firearms, and reinstituting the requirement that merchants keep records of sales and check the validity of licenses. If Bill C-19 passes, the Canadian government could be putting many lives at risk”. CFUW believes that Canada must look for comprehensive solutions to help address the root causes of gender based violence, such as poverty, inequality and misogyny. We must also maintain certain safeguards like the long gun registry that help police remove weapons from dangerous people. This December 6th we remember the lives of the 14 young women who were senselessly murdered at Ecole Polytechnique because they were women. We go forward as we continue to fight against the inequality and beliefs that created the violence twenty-two years ago – and the violence that continues to take place against women. This entry was posted in Uncategorized on December 6, 2011 by cfuwadvocacy. OTTAWA- With less than a week to go before the international community meets in Germany to discuss the future of Afghanistan, Afghan women fear for their rights and future security. Days ago, the Afghan government took an important step by including 13 women in its delegation to the Bonn II conference. However, their participation does not guarantee that the international community will not make concessions on women’s rights in order to appease the Taliban. The political process that should enable long-term stabilization of the country. With a substantial Taliban presence expected in Bonn, Afghan women are concerned that the conference could legitimize Taliban groups. In late October, a small delegation of Afghan women led by Dr. Massouda Jalal, a former Afghan Minister of Women’s Affairs, and head of the Jalal Foundation visited the International Federation of University Women (IFUW) in Geneva to express their concerns surrounding the Bonn Conference and to ask for the help of IFUW and its 61 National Affiliates in pressuring their national governments to ensure women’s full and active participation. Dr. Jalal stated that without the strong representation of women, these discussions could result in a loss of the small gains made by women since the Taliban was ousted ten years ago. Since then access to education for girls has increased significantly and women’s representation in parliament has improved. Under the new Afghan constitution women and men are now seen as legally equal, and the government has taken an important step by ratifying the Convention on the Elimination of All Forms of Discrimination Against Women (CEDAW). In 2009, the government also enacted a law to eliminate violence against women. Yet Afghan women have a long way to go before they reach gender equality. A United Nations’ report released just last week shows that the Government of Afghanistan has done little to actually enforce the law. In the two years since the law was enacted, the government has only pursued a small percentage of the reported crimes against women, leaving much room for improvement. Since September, women’s groups in Afghanistan and abroad have repeatedly called on their governments to guarantee women’s full and active participation during the discussions in Bonn and to ensure women’s issues are made a high priority. In making this urgent plea, both IFUW and the Canadian Federation of University Women (CFUW) have invoked the UN Security Council Resolution 1325 (UN resolution 1325), which calls for the full representation of women in all conflict and peace processes. While women’s groups are very pleased by the Afghan government’s decision to include 13 women out of its 40 delegates to the conference, if the Afghan government and the international community fail to take a vigorous stand to protect women’s rights at this meeting, and instead, use those gains as a bargaining tool to bring the Taliban into the peace process, it could set women’s rights back ten years. Taliban insurgents still have a strong presence in a number of provinces and have demonstrated their willingness to limit women’s rights. Female officials from the provinces of Ghazni and Wardak have reported direct threats from the Taliban and fear for their security, as they are prevented from travelling outside of provincial centres. Gains that have been made in girl’s education have also been almost completely reversed. With the conference quickly approaching, other organizations and activists must join in calling on the Government of Canada to implement UN Resolution 1325, and insist that Afghan women’s right be made a priority in Bonn. This entry was posted in Uncategorized on December 2, 2011 by cfuwadvocacy.